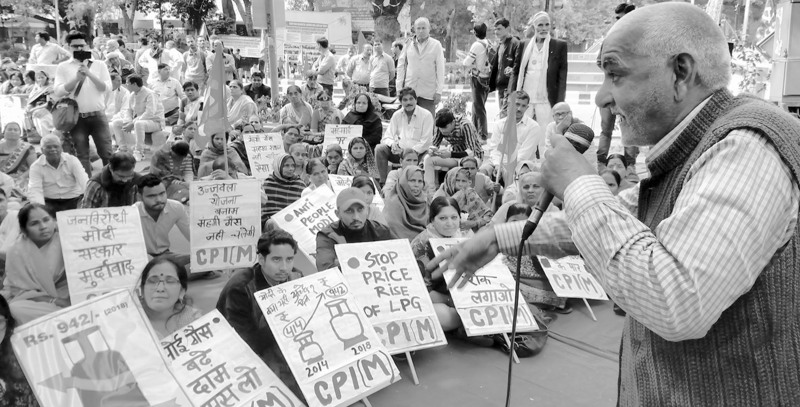 THE Delhi state committee of CPI(M) has organised a sit-in in front of parliament on November 22 demanding immediate roll back on increased price of LPG. The price hike of subsidised and unsubsidised gas cylinder by the oil companies is totally unjustified and will be an intolerable burden on people already suffering from price rise. With such a hike in LPG prices, people have to now buy gas cylinders at exorbitant prices. Addressing protesters, CPI(M) Delhi state secretary K M Tiwari said that the insistence of the oil companies that Aadhaar identification number is required for getting subsidised gas cylinders has created a burden on the common people. He further elaborated that the cost of a subsidised LPG cylinder (14.2 kg) has risen by 21 per cent while that of the non-subsidised cylinder has zoomed up by nearly 80 per cent in the past two and a half years, thereby effectively destroying the Pradhan Mantri Ujjwala Yojana (PMUY) as well as family budgets of crores of people. The Ujjwala Yojana has been much applauded by the media and the BJP leaders. Over five crore women belonging to the officially recognised ‘Below Poverty Line’ (BPL) families, were given a one-time subsidy of Rs 1600 for getting an LPG connection and a cylinder. Once the first cylinder was over, families had to get a refill paying the subsidised cost. For many poor families, especially in rural areas, the current cost of Rs 507.42 per cylinder is too steep. Even poor people in Delhi are not able to buy subsidised cylinder. As a result of this, families are using the gas sparingly, falling back on traditional cooking fuels like cow-dung cakes, wood etc. Some reports indicate that “inactive” consumers (those who do not refill within three months) may number up to 15 per cent of all consumers. Other reports suggest that the number could be as high as 3.8 crore. Meanwhile, the situation of non-subsidised LPG consumers, which form the bulk of Indian consumers is even direr. LPG prices for them have increased dramatically from Rs 527.50 in May 2016 to Rs 942.50 in November 2018 per cylinder. That is a jump of nearly 80 per cent. It is also noted that a flourishing black market in LPG is in place now with cylinders selling for as much as Rs 1200. For a poor family, which is not BPL, it is impossible to bear this cost. Note that the present definition of BPL is an income of Rs 131 per day, which is ludicrously low. However, the rising prices of LPG and falling consumption scenario shows that people are burdened with steep hike which has devastated their kitchen budget. Dharna was also addressed by other state committee members which includes Asha Sharma, Sidheshwar Shukla, Subeer Banerjee, Shiv Kumar, Kavita Sharma, Gangeshwar Dutt Sharma and Sheba Farooqui. It was presided over by Nathu Prasad.